The U.S.dollar finished at 1,092.00 won on the Seoul currency market Monday , down 12.50 won from last Friday's close, hitting a seven-year low versus the local currency. Monday's close was the lowest since Nov. 24, 1997, when it closed at 1,085 won. Though widely expected, the appreciation of the currency appears to be too fast and steep to just leave the market alone. The central bank unexpectedly trimmed its benchmark interest rate on Nov. 11, saying the won's appreciation helped ease inflationary pressure. This sparked speculation the bank might refrain from intervening for some time. 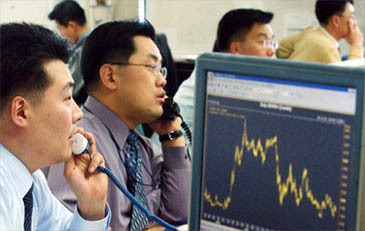 The won gained sharply this month, finishing at 1,103.5 per dollar on Nov. 9 — the strongest since Nov. 24, 1997 and again to break the psychological defense line of 1,100 won Monday. "It will be hard to break the 1,100 level this year," Park Jeong-Woo of Daishin Economic Research Institute predicted earlier last week. Local business community maintained that the won's upward march should be limited, as any rise above the 1,100 mark should make exporters feel frustrated. Unlike in the past, however, the government cannot — and should not — do much to stem the unwanted rise. That is, businesses ought to learn to live with a strong won and weak dollar for some time to come. 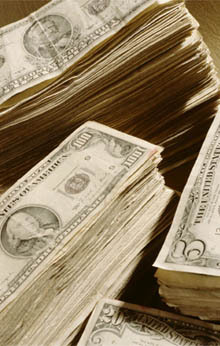 As with other economic variables, the exchange rate's movement is a double-edged sword for the economy. Government intervention to keep the local currency weak against the greenback increases exports and manufacturing output, but reduces domestic service production and employment, as the Bank of Korea recently pointed out citing the case of Mexico. Some maintain the won's ongoing strength should be an occasion to shift from the one-sided promotion of exports to boosting domestic demand. So the atmosphere appears ripe for a strong-won era — except for the situation among numerous small- and medium-sized exporters and the still stagnant national economy. As the government has failed to turn brisk exports into vigorous domestic demand, the economy will fall into a deeper slump if the single growth engine of exports starts to sputter. It is simply impossible for Korea to shift to an economy oriented toward domestic demand while the base of the local manufacturing industry hollows out. 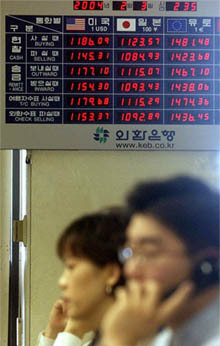 The outlook for Korea's third-quarter growth also remains weak, according to Finance Minister Lee Hun-Jai. The third-largest economy in Asia grew 5.4 percent in the first half. But "the growth in the third quarter may fall short of 5 percent," Lee said. "GDP growth will probably be lower than 5 percent in the fourth quarter as well. But for the whole year, we're likely to achieve a 5 percent expansion." Research institutions at home and abroad have downgraded their growth forecasts for this year and next, mainly citing the longer-than-anticipated slump in domestic demand. In the latest such move, Goldman Sachs has recently lowered its Korean GDP outlook for next year from 4 percent to 3.7 percent.